Judy Chicago says the Brooklyn Museum's exhibition on her most famous work, Roots of The Dinner Party: History in the Making (until 4 March), "is the first ever to look at my creative process, starting with my research and going into how I transformed historical information into images". The large-scale installation, a banquet scene set for 39 mythological and historical women such as Sojourner Truth and Mary Wollestonecraft, is the star piece of the museum's Elizabeth A. Sackler Center for Feminist Art. 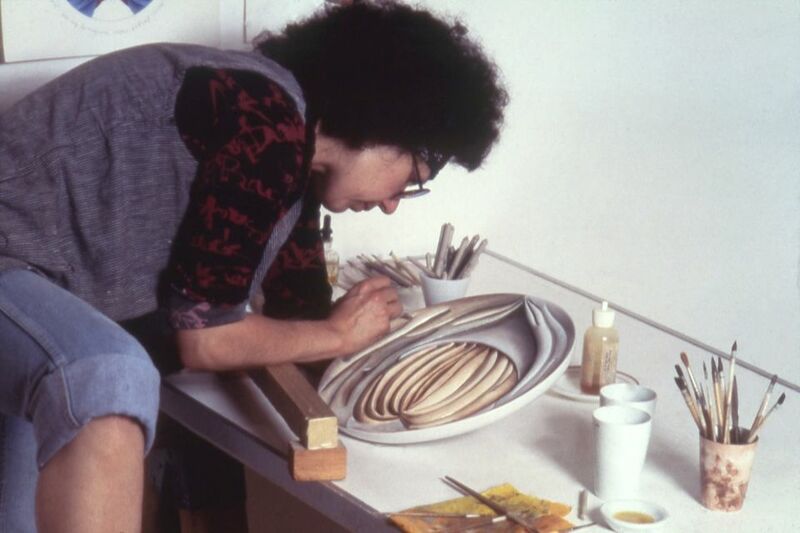 Its (her)story, including Chicago's innovative use of ceramics, is recounted through test plates, research documents, preparatory drawings and shots of the artists and her collaborators-"there was such a range of participation, from full-time workers to someone who stitched a single flower and sent it to the studio", she says. Chemex coffee filter paper, anodised aluminum, matte Mylar and plexiglass-Robert Ryman would draw on pretty much anything, using any medium, from ballpoint pen to contè to pastel to enamel. Robert Ryman: Drawings (until 24 March) at Pace is the first time the abstract painter's draught work has been the focus an exhibition. Over half of the 50 works displayed, which come from private collections and museums and range from the early 1960s until 2000, have never before been shown in public. Ryman's drawings are both an extension of and departure from his paintings. "As with any painting, you do have a surface to put the line on-what is that? How's the light going to work on it? and so on, so forth," the artist said of his work in the catalogue for his 1993 retrospective. "So the approach is very similar to painting, but the focus is on the line." The Museum of Modern Art's exhibition Tarsila do Amaral: Inventing Modern Art (until 3 June) is the Brazilian Modernist's first major solo exhibition in the US. From the early 1920s until her death in 1973, Tarsila was "central to the constitution of Modern art", says the curator Luis Pérez-Oramas. Among the 120 paintings and drawings includes are works the artist made in Paris, where she was influenced by peers such as Fernand Léger and Constantin Brancusi. The show also considers Tarsila's role in the Brazilian Antropofagia movement after she returned to São Paulo with her husband, the artist Oswald de Andrade, who wrote the group's manifesto in 1928. De Andrade urged Brazilian artists to strive to create a fundamentally Brazilian aesthetic by "cannibalising" a mixture of Brazilian and European culture and Modern art. The recent reassessment and appreciation of Tarsila's work challenges "the illusion that we have come to terms with Modernity and the variety and richness of Modern art", Pérez-Oramas says. "She continues intriguing and challenging artists and intellectuals."